As part of my monitoring process, I review the list of dividend increases every week. I am able to monitor companies I own and those I may be considering owning at the right price. I find the rate of recent dividend increases to be very telling about management’s expectations for near term profitability growth. If they believe that their company is operating at a predictable rate, they are likely to consider growing the dividend close to the historical average annual rate of increase. If there is the expectation for a deceleration in profitability, we will see management growing their distribution’s at a much slower pace than before. This is why I try to compare the most recent dividend increase relative to the ten year average. In order to get more context, I also review the historical trends in earnings per share along with the near term earnings expectations by Wall Street Analysts (which should be taken with a grain of salt of course). Over the past week, there were several companies that announced dividend raises to their shareholders. After going through the press releases, I also included some comments from top executives, which should summarize their opinions on dividends. As usual, I focus on companies that have managed to increase dividends for at least a decade. I want companies that can pay and grow dividends throughout the economic cycle. Cummins has managed to grow dividends at an annual rate of 25.60%/year over the past decade. The strong dividend growth was possible due to the low starting payout ratio a decade ago, and is unlikely to be repeated. I would expect forward dividend growth to be closer to the last increase, than the amounts over the past decade. Between 2008 and 2017, the company managed to grow its earnings from $3.84 to $5.97/share. Analysts expect that Cummins will earn $13.48/share in 2018. The stock seems attractively priced at 10.20 times forward earnings and yields 3.30%. For more conservative investors, the stock may be a pass based on trailing P/E that is above 20. The next step in the process is determining for yourself whether Cummins makes sense for you at the moment, or is a pass. Isn’t investing fun? The J. M. Smucker Company (SJM) manufactures and markets branded food and beverage products worldwide. It operates in four segments: U.S. Retail Coffee, U.S. Retail Consumer Foods, U.S. Retail Pet Foods, and International and Away From Home. The company raised its quarterly dividend by 9% to 85 cents/share. This marked the 20th consecutive annual dividend increase for this dividend achiever. J.M. Smucker has been able to grow its annual dividends at a rate of 10%/year over the past decade. Between 2008 and 2018, the company has managed to grow earnings from $3.11 to $7.96/share. (The 2018 figures were adjusted for the substantial nonrecurring benefit related to U.S. income tax reform) The company is expected to earn $8.45/share in 2018. The stock is attractively valued at 13.10 times forward earnings and yields 3.10%. Check my analysis of J.M. Smucker for more information about the company. Enterprise Products Partners L.P. (EPD) provides midstream energy services to producers and consumers of natural gas, natural gas liquids (NGLs), crude oil, petrochemicals, and refined products. The company operates through four segments: NGL Pipelines & Services, Crude Oil Pipelines & Services, Natural Gas Pipelines & Services, and Petrochemical & Refined Products Services. This dividend achiever raised its quarterly distribution to 43 cents/unit. This distribution represents a 2.4% increase over the distribution declared with respect to the second quarter of 2017. This is the partnership’s 56th consecutive quarterly distribution increase and the 65th overall distribution increase since Enterprise’s initial public offering in 1998. All of this means that Enterprise Products Partners has rewarded unitholders with growing distributions for 20 years in a row. Over the past decade, this MLP has managed to grow distributions at an annual rate of 5.70%/year. The recent trend is for a much slower distribution growth. The partnership is one of the most conservatively managed ones out there, as it reinvests a portion of distributable cashflows back into the business. Enterprise Products Partners therefore has a more sustainable payout, since it doesn’t pay everything out to limited partners in the form of distributions, and leaves a cushion just in case. It currently yields 6.10%. "For 92 consecutive years, the dividend has played an important role in delivering value to our shareholders," said Lynn Good, chairman, president and CEO. "This increase reflects continued confidence in our ability to produce strong financial results as we execute our long-term strategy." Duke Energy has managed to grow dividends at an annual rate of 4.50%/year over the past decade. The company grew earnings from $3.03/share in 2008 to $4.37/share in 2017. Forward earnings for 2018 are expected to hit $4.73/share. The stock is fairly valued at 17 times forward earnings and has a 4.70% dividend yield, which is fairly well covered. A couple of weeks ago, we also had Medtronic (MDT) announcing a dividend increase. Not sure how I skipped it in my weekly reviews in June, but the company raised its quarterly dividend by 9% to 50 cents/share late last month. 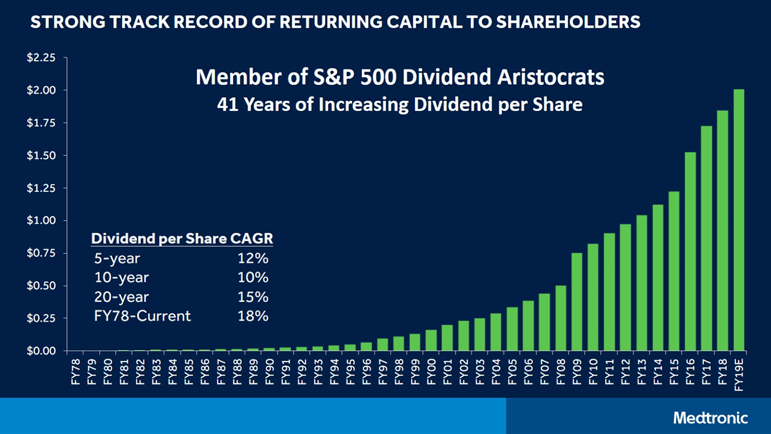 This announcement marked the 41st consecutive year of an increase in the dividend payment for Medtronic, a constituent of the S&P 500 Dividend Aristocrats index. Medtronic's dividend per share has grown by 300 percent since fiscal year 2008 and has grown at a 17 percent compounded annual growth rate over the past 41 years. "We are committed to creating shareholder value through efficient and disciplined capital allocation, and this starts with providing a strong and growing dividend to our shareholders. Today's dividend increase reflects the confidence of our board and management team in the strength of the company's cash flow generation," said Omar Ishrak, Medtronic chairman and chief executive officer. "We are focused on continuing to improve our cash flow conversion, creating additional capital that can be both reinvested to drive future growth and returned to our shareholders." Medtronic is a very interesting example on the limitations of using earnings per share on a GAAP basis. Understanding its true earnings power requires a little bit of extra work on the hands of the investor. For example, in my analysis of the company I use non-gaap earnings per share of $4.77 in 2018 and $4.60 in 2017, rather than the $2.27 and $2.89 in GAAP EPS. For example, certain items related to the amortization of intangible assets will depress earnings per share by at least $1.10/year for a long time. This is purely an accounting term, meant to satisfy a FASB requirement, which doesn’t impact long-term earnings power of the business. Check my analysis of Medtronic for more information about the company.